Ann Shanley is director and founding member of Kindred Spirits Enterprises, which supports transforming indigenous projects. Ann attended a Farming Together forum about the pros and cons of the co-operative business model and thought it could be a good cultural match for a group of collaborating indigenous farmers. 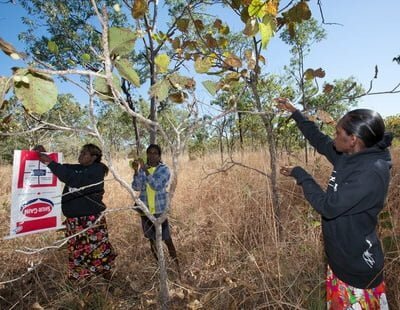 The group, from Kakadu, Kimberley and Wadeye in Arnhem Land were growing and harvesting native fruits. 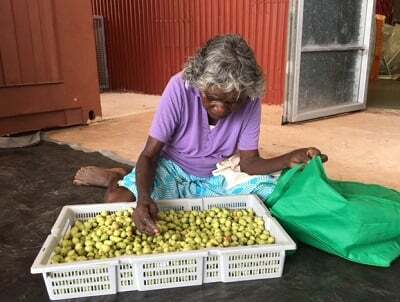 Sorting Kakadu Plums or mimarral as it is known in the region. Women at Wadeye collect mimarral which is processed at Wadeye. Althea Jabinee (right) and Elizabeth Gumaduck pick the fruit. Farming Together contacted an experienced co-operative consultant to assist in a unique way. The consultant attended a workshop in Darwin, hosted by Australian Native Food & Botanicals, and spent time ‘story telling’ the ins and outs of the co-operative model, its benefits and ptifalls. The yarning method of this delivery resonated with the growers and generated much discussion about, and understanding of, co-operation as a business structure. This style of information delivery was especially appreciated by the group. “Many of those attending were wary of talking about co-ops as they had seen things go wrong with other industries. Sam, from Co-ops NSW, was so clear, understanding and knowledgeable that forming a co-op is back in the centre of the table,” Ann Shanley. The group secured additional support to progress their business planning and development and formed a cross-project working party to oversee access and benefit sharing. The group is continuing to explore and develop the business plan and structure to ensure all members benefit equally. "Everything takes a very long time, but the information from the workshops helped everyone decide that a co-operative structure was the way forward. Local Indigenous owned and operated enterprises can join together to share research, supply chain and marketing opportunities," Ann Shanley. “Farming Together was truly helpful to us. They provided clarity around issues, and the consultant presented in a way that everyone could understand. Most importantly, all felt comfortable to ask questions. We wouldn’t have been able to move forward as we have without the program. We can't thank you enough for helping get that to happen,” Ann Shanley. The group has submitted highly regarded research grant applications to The Cooperative Research Centre for Developing Northern Australia (CRCNA). One grant was submitted on developing a model for a Traditional Medicine Agribusiness; the other was to develop the Kakadu Plum and an indigenous botanicals supply chain, including protecting their IP, with advice from The University of Queensland's Law Department.